Most connect the city of Fulda with the same name of the world famous brand tires. But Fulda produces more associations in everyone who visited this magical city in the heart of Germany. 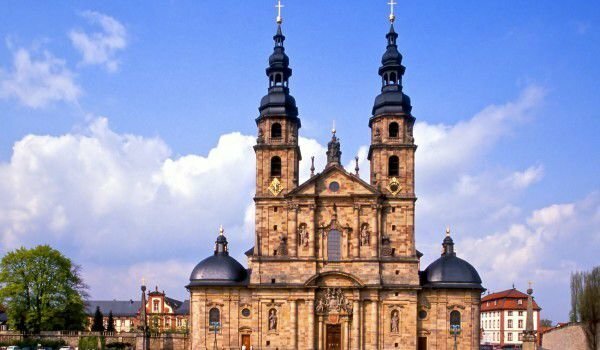 Fulda is located right at the intersection of four major cities in Germany - from Hamburg to the north, Munich in the south, west- Cologne and in the east- Berlin and Dresden. Fulda is actually a very small town with beautiful old architecture. Through it passes along the eponymous river Fulda. The city's history began 1250 years ago. In 744, on March 12, in this place was founded the monastery of Saint Sturm, Sturmius. He acted under the tutelage of Boniface, which is considered the founder of the Franconian church and the apostle of all Germans. Excavations show that at the site of Fulda, there was a settlement long before that time. Even today the tomb of St. Boniface is located in Fulda and each year it is visited by thousands of devotees. To accommodate the crowds of Christians, a small basilica that was built in the 8th century, had to be rebuilt and expanded significantly. Nowadays, this basilica is considered the largest church north of the Alps. Since its inception, the Fulda settlement is subject to the German Emperor. In the 18th century, however, the settlement was managed by the Prince Bishop. This remained so until 1802 when Napoleon dissolved the diocese. In the 18th century Fulda goes through a radical change of the Baroque era. The city is literally reconstructed and many beautiful baroque buildings are added. Between 1704 and 1712, the Cathedral of Fulda was rebuilt, and Stadtschloss castle was erected between 1707 and 1712. Architect of both buildings is the master Johann Dientzenhofer. In 1764, a porcelain factory opened in Fulda, but after the death of the then Prince-Bishop, the plant is closed. However, porcelain produced in Fulda is highly valued and expensive for collectors because of its craftsmanship and quality. The cathedral in Fulda is remarkably beautiful. It was built on the model of St. Peter in Rome and is dedicated to St. Salvador and St. Boniface. Here, in the crypt were laid the remains of St. Boniface. In the Cathedral Museum can be seen remarkable objects of religious art. One of the most remarkable works of art here is a work of Lucas Cranach "Christ and the adulteress". The old church of St Michael was built in the 9th century and today is considered one of the oldest churches in Germany. The city of Fulda’s Palace was once the seat of the Prince-Bishops, and today is occupied by urban authorities. It is an amazing baroque building with incredibly beautiful interior decoration. Visitors have the opportunity to see the Hall of Mirrors, Imperial Hall and its beautiful plaster ornaments. Concerts are held most regularly in the Princes Hall and the Castle keeps a valuable collection of local porcelain. The gardens of the castle are fabulous - there is na incredibly beautiful conservatory. At the park visitors can enjoy picturesque flowers and shrubs, while relaxing with some coffee.